An inspiring piece of artwork done using PowerPoint AutoShapes and well synchronized with the beat of the music. PowerPoint showcase featuring advanced text animations mirroring an excerpt of Ellegarden's (a Japanese rock band) motion video, Marry Me. Omegaoma's Motion is a state of art showcase done in PowerPoint. It demonstrates how sophisticated animations can be achieved and presently elegantly in PowerPoint. Watch the head of Optimus Prime from Transformers drawn and animated in 3D. The movie includes short anime scenes such as a female character running across a field. Entry #6: Santa Claus M. D.
Story of a sick infant who gets a life-saving surgery by a smooth operator. This sample shows an anime character, Vita, fishing besides the pond. An artwork that depicts the protagonist and villains in Super Paper Mario. This artwork shows you a landscape scenery from two different viewpoints. Drawing of Kuchiki Byakuya, a fictional character in the anime and manga series, Bleach. Drawing of his best friend, Ely. An artwork showing characters from Lucky Star manga. Graie and B are two adorable and attractive Powerpuff characters drawn by Jerry. Are you in the mood for more than one game at a time? In Pixel Scene, you will be able to play a variety of mini games! Play a maze game, an action game, use the avatar creator, practice with targets, and so much more! Ultimate Sniper is a PowerPoint shooting game. The objective of this game is to accept missions, assassinate your opponents and become the ultimate sniper. Pointer's Way is a PowerPoint maze game. Scroll your way through 84 levels, with new improved graphics, hazardous obstacles and a hidden environment world. Music ver. C is a PowerPoint music rhythm game. The objective is to test the player's ability to follow a musical beat and stay with the rhythm of Pachelbel's Canon. Animation Vs Newbie is a PowerPoint Movie inspired by Animator vs. Animation, with a stick figure interacting on PowerPoint 2007 interface with the animations done entirely in PowerPoint. Infiltration is a PowerPoint Movie featuring advanced PowerPoint animations by Jeremiah Lee. The story goes about a stick figure who risk her life to rescue her mate by infiltrating into a highly defended city. Furford University is a PowerPoint Movie where slide-by-slide animations are heavily utilized. This movie introduces you to the adventures of mice and vermin that inhabit within a college dorm's walls. 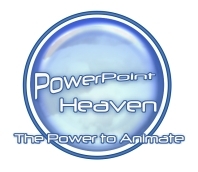 on PowerPoint Heaven Broadcasting Channel.